GOLD Stocks ALERT: Swallow THIS! If you want to know EXACTLY why junior mining stocks have been hard on investors, read today’s letter and know that the torture is coming to an end. Personally, I’ve closed all my hedging positions – there are no more short positions on gold ETFs or gold stocks in my book or my fund. If you have any short exposure to the sector, you’re committing suicide because the downside is completely meaningless compared to what’s in store. I want to strictly focus on this data set today and show you why the gold bull market is about to undergo a 1971 moment. In the next few years, I believe that many of the biggest gold investors will turn a 10 million dollar position into over a hundred, easily. 1,000% returns will be the average for the industry, and this might happen sooner than you think. 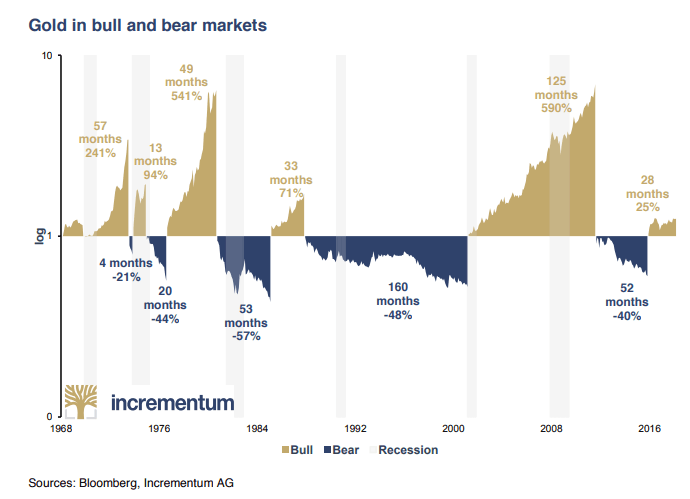 Average Gold Bull Market: Starting in 1971, we’ve had six boom cycles, lasting an average of 60 months, with the shortest ending after 13 months and the most moderate yielding a 71% return. This current one is already 28 months into it, so we know it is only halfway through, statistically speaking, but gold is only up 22.7% for the period, so we are in for one legendary move, even if it only scrapes the 71% total return mark – gold needs to make up for under-delivering. Remember, gold bottomed at $1,053, after a 40% drop. If it only rallies 71%, the worst bull market thus far, it has an additional $507 to go. Bull Markets Are Shorter Than Bear Markets: Notice how all the bear markets are brutal, taking gold down -21%, -44%, -57%, -48%, and -40%. But then, on the flip side, notice how the swift bull markets are much more epic, rallying gold by +241%, +94%, +541%, +71%, +590%, and the current one we’re in, a modest +22.7%. This is the reason that the miners haven’t joined the rally – it is extremely anomalous for a bull market to be this calm. In 2017, we saw no volatility in the stock market, whereas 2018 is highly volatile. In 2017, we saw a roller coaster cryptocurrency rally, whereas 2018 is mostly tame, after the crash. Storms are followed by mild weather, and peace is followed by war. Gold is setting up a legendary rally, to make up for lost time. You can bet, with the same certainty of the sun rising tomorrow, that when gold prices reach $1,495 or higher, mining stocks will give you a chance to book returns, only rivaled by what I expect the hghest quality Artificial Intelligence stocks to deliver in the next two years. There is no connection between a recession and the price of gold:Though I hear countless YouTube “gurus” predicting higher gold prices, due to a recession in the U.S. or in the global economy, do not fall into this silly trap. There is no statistical cause and effect relationship between these two events – a gold bull market and a recession are uncorrelated. 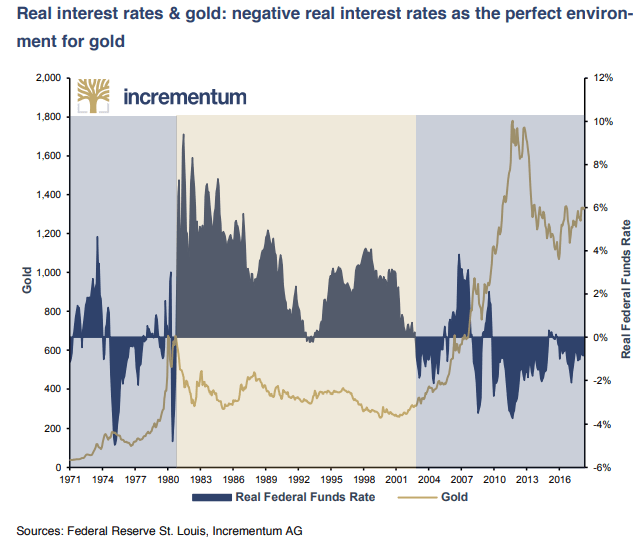 Gold, historically speaking, is highly responsive to negative interest rates, as are measured by the FED Funds Rate deducted by inflation. Notice how the 2011 peak coincided with interest bottoming at the -4% and rallying up by 4%, becoming positive for several months, before starting a new decline. We are heading into a period of much higher inflation with moderately higher interest rates, so gold prices are destined to go even higher, but not modestly at all. There has never been a rally, which ended with a +22.7% end result. Lastly, I want to make sure you’re aware that there is ZERO POSSIBILITY for the Federal Reserve to stop inflation, as it did in the late 1970s by jacking-up interest rates to nearly 20%. Back then, the U.S. was the largest creditor nation on the planet, lending funds to developing countries. Today, it is the largest debtor nation in history. Politicians have screwed up so badly that to say they spend like drunken sailors would be an insult to the sailors. 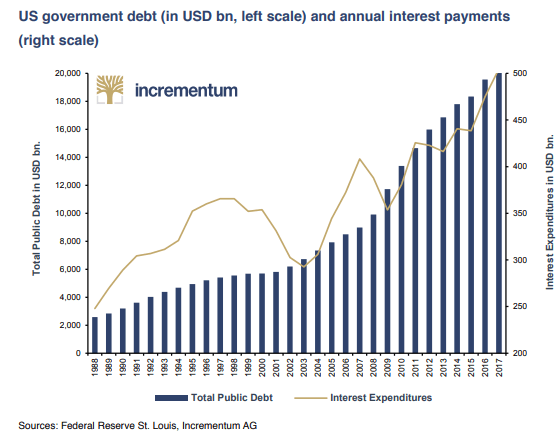 The weight of the interest payments will devastate the U.S. Federal Government; therefore, I expect inflation to be the disease of the coming decade. This Sunday, the 10th of June, will be the most important day in Wealth Research Group’s history, and I intend to make a critical announcement.